Introducing Catego a flea and tick product made especially for cats. Catego kills fleas in 6 hours while Frontline Plus and Advantage II kills fleas in 12 hours. Catego works to address your cat’s needs by killing fleas, flea eggs, flea larvae, ticks and chewing lice. 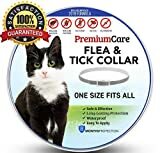 Catego works for a full month and fleas do not need to bite your cat for our product to work. In addition, our product has patented applicator making it easy to administer and effectively get under your cat’s coat to the skin. Catego works for cats over 1.5 lbs and 8 weeks of age and is available in 3 packs and 6 packs. 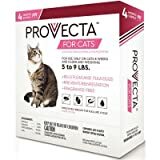 Provecta for Cats is a once-a-month dose topical application that is indicated to kill and prevent flea infestations on cats eight weeks of age and older and weighing five pounds and over. Active ingredients include: Imidacloprid 9.10% and Pyriproxyfen 0.46%. See package insert for complete product details. 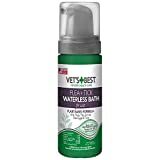 Vet’s Best Flea and Tick Waterless Bath Foam for Cats eliminates fleas, flea eggs, and ticks by contact, leaving your cat clean and spa day-fresh. Carefully formulated with certified natural essential oils and plant-based ingredients, including peppermint oil and eugenol (from clove plants), this waterless shampoo is safe to use and cats and kittens 12 weeks or older when used as directed. A natural alternative to harsh chemicals which means you can use year-round to comfort and protect your cat. Cheristin for Cats (Spinetoram) is a topical flea treatment designed specifically for cats. While monthly application is recommended, Cheristin’s long lasting formula protects against fleas through 6 weeks and is applied using a rounded tip applicator for comfortable, easy application. 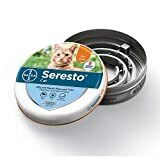 Cheristin comes in one dose size for all cats and kittens (1.8 lbs and greater or 8 weeks of age and older), making it great for families with multiple cats. Cheristin is available without a prescription. Note: *Cheristin is for use in cats and kittens 8 weeks of age or older and weighing 1.8 lbs or more. Always read, understand, and follow the label and use directions. How to Apply Cheristin 1. Hold the applicator tube upright and press cap down until it clicks, indicating the tube has been punctured. 2. Remove the cap and make sure there is an opening at the tip of the tube. 3. Part the hair on your cat’s neck at the base of the head until skin is visible. 4. Place the tip of the tube directly above the skin and squeeze 2-4 times to dispense the contents directly on the skin. 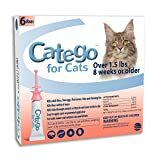 Other Application Tips • Do not use more than a single dose per month on an individual cat. • For best results, apply at the base of the head, not between shoulder blades. • Avoid getting Cheristin in your pet’s eyes or mouth. • Do not allow your cat to ingest Cheristin. Feline flea infestations are quite common and it often goes unnoticed. It's only when cats start to excessively scratch and nibble certain areas the problem becomes apparent. Flea bites can cause skin irritations and severe discomfort to your cat. As a loving pet parent, it's your responsibility to provide relief and treatment. Advantage II series of anti-flea products by Bayer are globally popular products to treat the problem. Its topical formulation acts fast by killing the adult fleas and destroying larvae and eggs. This particular product is specially made for large cats weighing more than 9lbs. Advantage II Flea Control is waterproof, which means it does not wash out or lose its effectiveness when the cat gets wet. This pack contains 6 tubes, each for one month of flea protection. 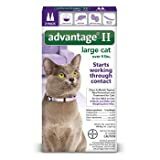 If your cat has a special health condition, speak to a veterinarian to find out if Advantage II is right for your pet. Tell pesky parasites to ‘bug off’ with Hartz UltraGuard Pro Flea & Tick Treatment for Cats and Kittens. Each convenient and easy to apply, single dose tube kills fleas, deer ticks, flea eggs, flea larvae and prevents re-infestation, stopping the flea life cycle in its tracks. Also repels mosquitos. The proprietary Pro-cision Flo applicator easily penetrates short and long fur for on-skin application, directly onto your cat's skin. Formula stays on and does not rub off. Use only on cats or kittens 5 pounds and over, 12 weeks of age and older. Package contains three applications—a three-month supply. Directions: Remove one applicator tube from package and hold in an upright position away from your face. Twist dispensing tip clockwise about 1/2 turn while pushing down to break the tube's seal. Do not remove the dispensing tip. Position the tip of the tube at the base of the pet's back between the shoulder blades and squeeze out the entire contents of the tube to form a stripe as you move from the shoulder blades along the back to the base of the tail. The treated area may appear oily after application. Repeat every month. Consult a veterinarian before using this product on debilitated, aged or medicated pets. If signs of sensitivity occur, bathe your pet with mild soap and rinse with large amount of water. If signs continue, consult a veterinarian immediately.